How on earth is it September already? Summer is now officially over (cries). 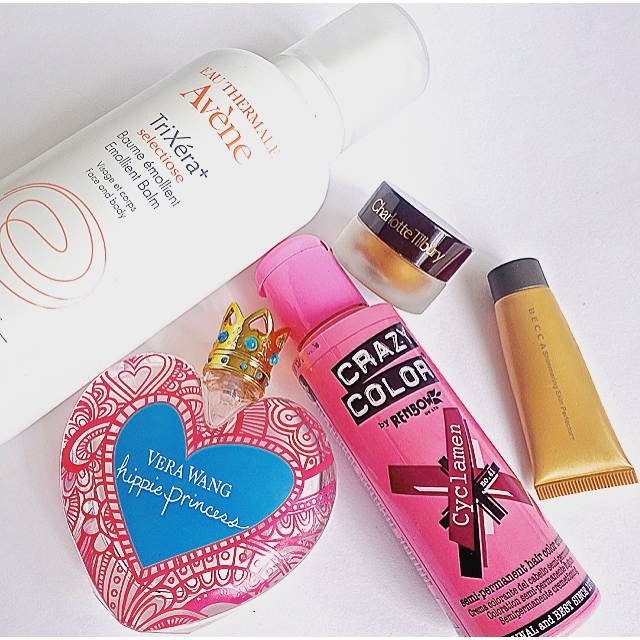 Here are the products that I’ve been loving over the past month, whilst holding on to every inch of sunshine. First up is my absolute skin saviour. I have been battling with my eczema for months now. I even had to ditch most of my skincare to replace it with the doctor’s orders – Diprobase and the dreaded steroid cream. I try to steer clear of these normally but recently the eczema has been creeping up my neck on to my face – not nice at all! 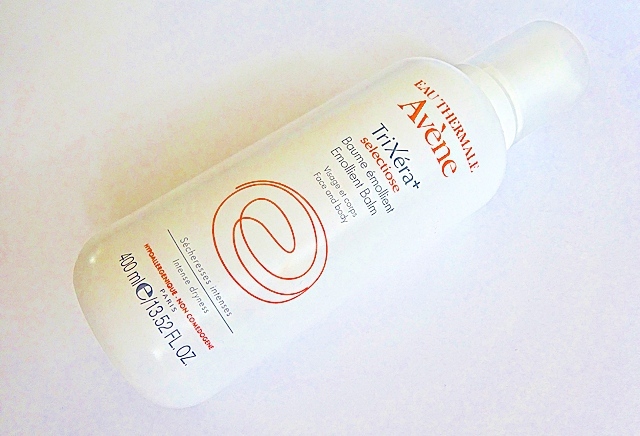 I have been using Avene cream to keep my dry skin under control since the age of twelve. I’ve even featured it in my Skin Saviours post. In my moment of desperation I thought I should go against the prescribed creams and go back to my old comfort zone – Avene Trixera. And I am so glad that I did! Slowly but surely the redness and dry patches have calmed down and I can now go out without trying to hide my face behind my hair. You don’t have to be an eczema sufferer to use this, I have suggested this to many friends who now use it as religiously as I do. It’s a great moisturiser that does the job and I thank it for bringing my skin back to life. I promise not to stray from it again. This Summer I have finally surrendered to dyeing my hair. I am very particular about not using too many products or heat on my hair normally, as I like to keep it in good condition. However, I do like to experiment with makeup and clothes, so I finally extended this to my hair as well. Last Summer I used pink hair chalk and absolutely loved the effect it gave. I recently revisited those photos and decided to go for the plunge of permanently pink hair. I headed down to Stunt Dolly in East London, where they told me that to achieve that look, they would have to bleach my hair before applying the pink dye. Now hold on a minute, I’m all for a bit of dye but I’ve heard about the drying effects of bleach and I have worked hard for these silky locks! I regularly douse my hair in Argan oil products and did not intend on undoing all of my good work. Instead, I went to the local hair shop (you Londoners would know the one in Ridley Market! 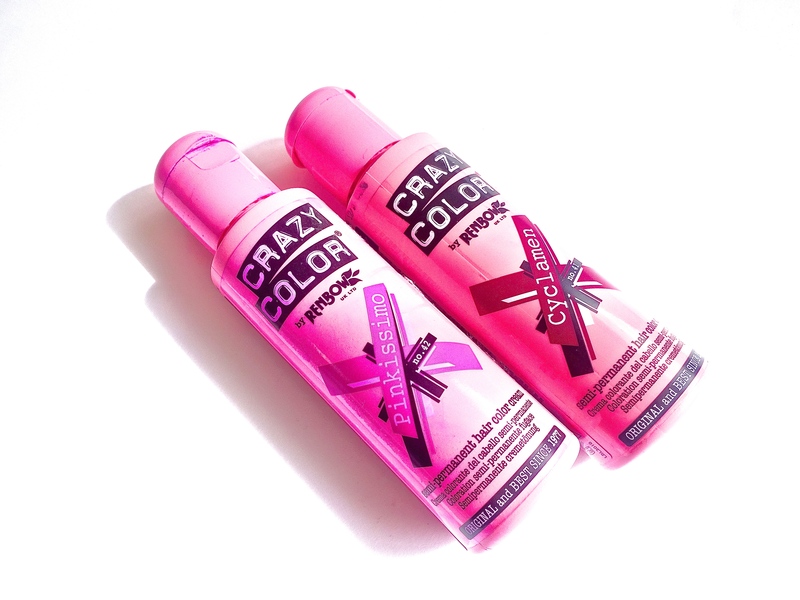 ), and I got the dye that Stunt Dolly would have used on my hair. I didn’t have high hopes for the pink dye to show up much on my incredibly dark hair, but I was very pleasantly surprised! Of course it wasn’t as bright as the initial colour that I applied into my hair suggested, but considering the lack of bleach my hair took well to it. I now have a discreet (unless in direct sunlight) hint of colour which actually reflects more of a burgundy than a pink. I love it! Maybe one day I will give in to bleach, but for now I am happy with my Crazy Colour hair dye in Cyclamen and Pinkissimo. Also, at under a fiver it’s cheap as chips! What colour should I try next? As mentioned before, I have eczema which unfortunately extends to my eyelids as well. This means that I usually have to avoid eyeshadow as it clings to dry patches. I know, life without eyeshadow is tragic – please feel my pain! I try to work around this by using more creamy products. I have tried many from the infamous Maybelline colour tattoo to the Kiko eyeshadow sticks. 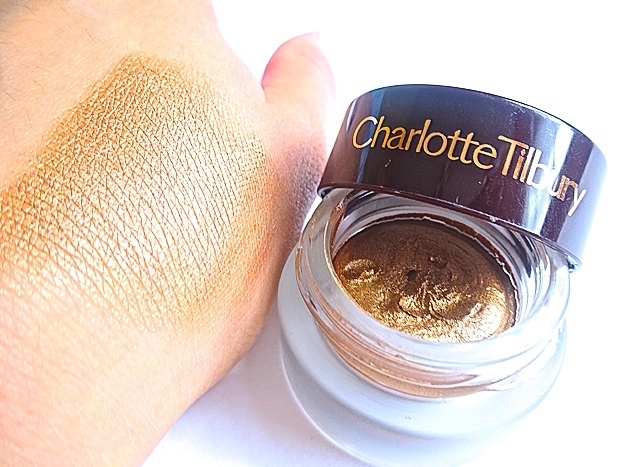 But none have compared to this little gem of a product from Charlotte Tilbury. The Eyes To Mesmerise creamy eyeshadow has been an absolute life saver. It’s infused with water and contains vitamin E which gives me the hydration that my skin needs. The creamy formula glides on effortlessly and leaves you with a gorgeous wash of colour that blends in with minimum effort. Perfect if you’re on the go and quite lazy with your makeup like me. 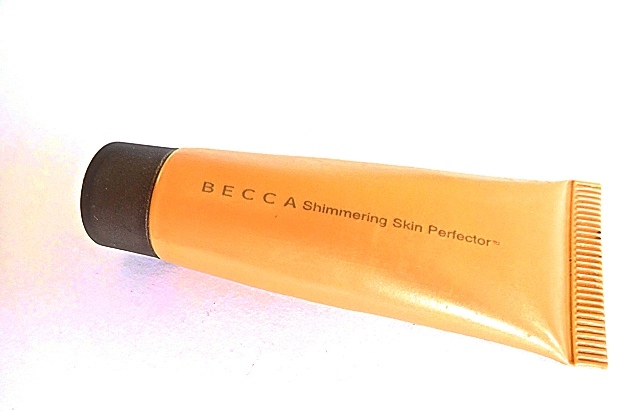 I have the shade Bette Davis, a beautiful amber-gold tone which gives your eyelids an illuminated golden glow and makes your eyes pop. Thank you Charlotte Tilbury for giving life and colour to my eyelids again! To add to my glowing eyelids courtesy of Charlotte Tilbury, I have been absolutely loving the Becca Shimmering Skin Perfector in Opal. I used this a lot last Summer but somehow between then and now it has been replaced by the Revlon SkinLights Illuminator, no doubt because of the more reasonable price tag. I recently ran out of my Revlon one and whilst searching through my drawer of highlighters (yes I have one of those), I came across this old favourite. I was reminded why I had loved this so much, it really does give you the most beautiful highlight, as if you are glowing from within. A lovely product for a naturally glowing skin. I might just have to head down to Space.NK, bite the bullet and buy the full size. Do you have any recommendations for cream highlighters? I also have my eye on that Charlotte Tilbury Wonder Glow… Last but by no means least, is this very pretty offering from Vera Wang. I can always tell what season it is by the fragrance that I am wearing. In Summer I tend to opt for more sweet, fruity and floral fragrances, think along the lines of CKin2u or the Escada summer scents. Vera Wang Hippie Princess has a wonderful exotic fruity scent that is literally a blast of Summer every time I spray it. Its notes of Mango, Freesia and Apple Blossom are sweet and comforting and I am not quite ready to let go of this perfume yet even though Autumn is fast approaching. Also, how cute is this bottle? I’m an absolute sucker for packaging, I mean it’s pink and has a crown – what else could a girl want? So there you have it, my August beauty Favourites.